Why not have your wedding day in an unusuall set-up. The beautiful panorama of Prague will offer you the most beautiful backdrops for the ceremony and the subsequent wedding feast you can wish for. Just imagine the photographs. Choose this original way to say "YES" to the love of your life. Are you interested in a cruise? 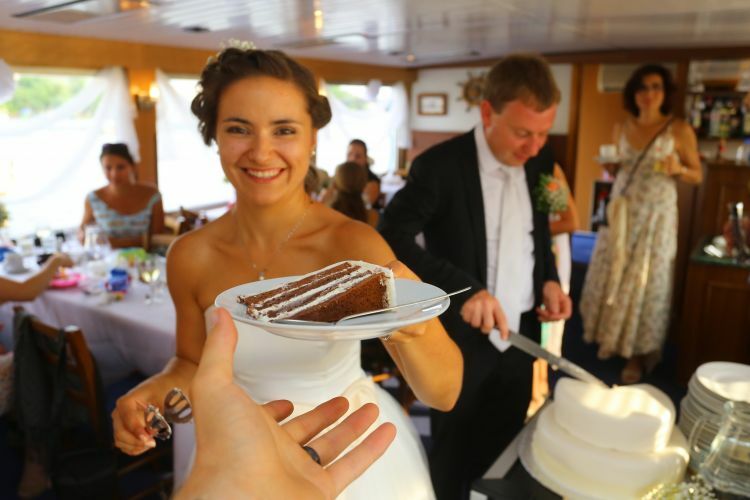 Wedding ceremony and meal on boat? Why not? Together we will choose the right boat for you. We offer boats with the capacity of 20 up to 200 guests. We will choose the right length of the cruise so it is not too short or not too long. We will also talk about the entertainment, decoration, photographer and other details to make it perfect. It is not as easy to find an official who will marry you on boat. Not every office offers wedding outside of the city office and therefore we usually leave this part onto the clients themselves. So the ceremony may not take place on the ship, you can just continue here with a wedding reception or a wedding party with friends and family. Good food will complete the perfect day. It is up to you to choose what wedding reception you want. We will discuss all details, whether to arrange a classic wedding meal or hot and cold wedding buffet for less formal feal. The cost starts at 820 CZK per person for a meal and drinks' package. After the ceremony and the lovely meal you are ready to party. We can arrange for all sorts of entertainment. Live music band, DJ, pohoto booth, fireworks or we can turn the boat into a mobile casino. Should you have a completely different idea, please do not hesitate to discuss with us. We will do our best to bring your dreams to life. Accommodation is only available for larger groups or smaller groups who book a complete program with us. So if you have a group of more than 20 people or you want to arrange a complete multi-day program, please do not hesitate to contact us. A van, a minibus or a big bus. Prague has its restrictions, so we will recommend where you can go with a large vehicle and where to park. We will arrange any transfer within Prague and outside of the city too. Buffet style dinner, tailor-made external catering, served menu. All this and more can be arranged starting on 550 CZK/person. Enjoy your private or corporate event and let a professional to take care of the photos/ video for you. This service includes the full package including editing photos. 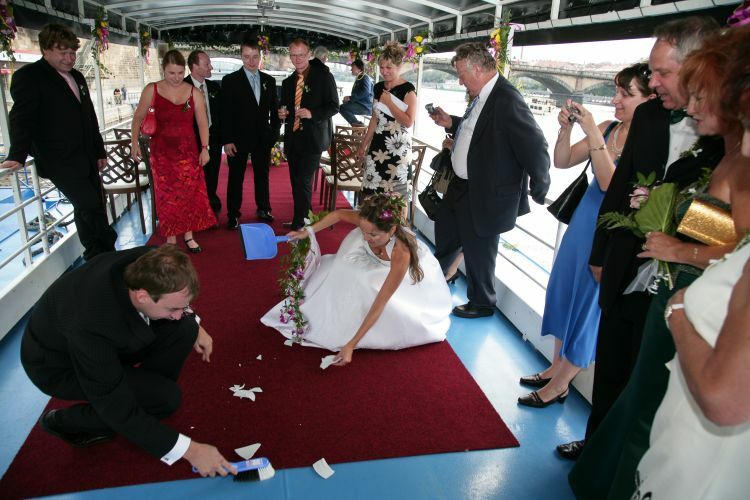 The price for a wedding day on a boat depends on how much time you want to spend on board, how many guests and what kind of meal and drinks' package you choose. 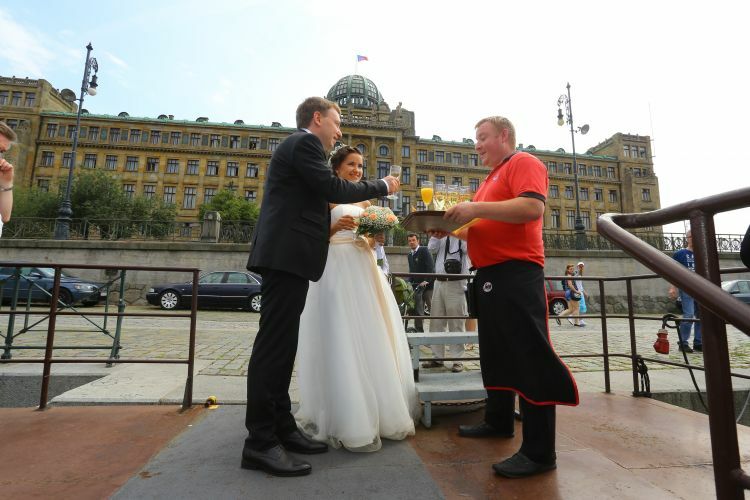 Generally speaking, a wedding on a boat can start at 13 000 CZK. We will help you to understand the different offers, will try to match your budget and according to that we will recommend the most suitable option for you. River cruise in Prague was a great experience for us! I never thought that the view from the river could be so different and unique! Thank you. Our impression couldn't have been spoilt even by the cold weather (what else to expect in late November really). The staff was nice and welcoming and it was pleasantly warm inside the boat. I can really recommend the cruise. There was just one downside - it was only a one hour trip.